The Most Widely Read Work on the Subject _ Completely Updated to Cover the Latest Developments and Advances In Today's Money Market! First published in 1978, Stigum's Money Market was hailed as a landmark work by leaders of the financial, business, and investment communities. 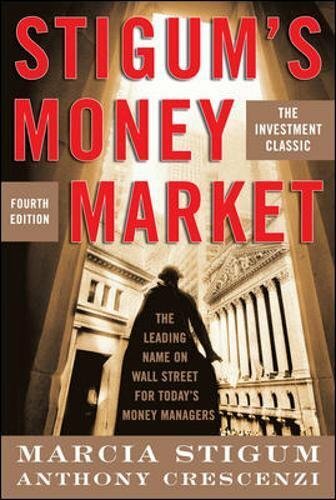 This classic reference has now been revised, updated, and expanded to help a new generation of Wall Street money managers and institutional investors. The Fourth Edition of Stigum's Money Market delivers an all-encompassing, cohesive view of the vast and complex money market…offers careful analyses of the growth and changes the market has undergone in recent years…and presents detailed answers to the full range of money market questions. This updated classic also includes hundreds of helpful new illustrations and calculations, together with an improved format that gives readers quick access to every major topic relating to the fixed-income market.